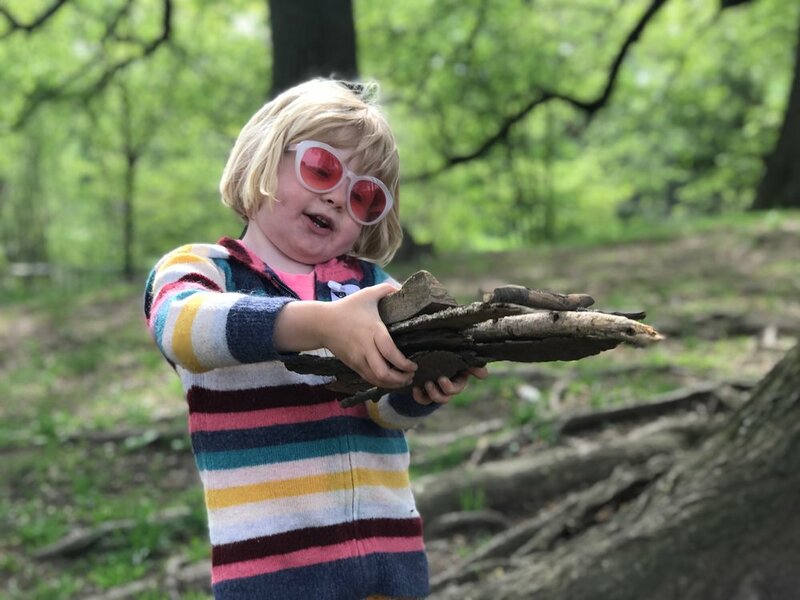 Our classes are a brilliant way to provide an alternative to preschool for children outdoors in New York City. Joining us multiple days each week gives your child the opportunity to regularly explore, play, and learn with us in our expansive natural classroom. Our 2019/20 program allows families to commit to multiple days a week for the full year. We offer a select number of spaces for year round enrollment to those families who we feel are best matched to our program and passionate about our philosophy. We meet year-round in all kinds of weather, offering drop-off classes for children ages two years to five years old. We keep a small student to teacher ratio, and small group size. This ensures that all the children are safe, supported, and heard while we adventure through the park. Our daily schedule includes time for ample exploration and unstructured free play, snack, nature journaling, and hikes through the park. Our curriculum evolves from the interests of the children, the seasons, the weather, and our natural surroundings. Strong emphasis is placed on awareness of our environment and those we share it with, helping the children develop a connection to and empathy towards the humans, creatures, and plants around us. During each class we provide various tools and found and recycled materials for the kids to work with. They combine these with the natural materials they discover to experiment, build, and create. Children also are given the opportunity to sing, dance and do yoga - outside! Our goal is to prepare for and embrace every kind of weather. We will work and play in the sun, rain, and snow. On days of extreme weather (high wind gusts, thunderstorms, or intense cold) we will meet in the Central Brooklyn Library or at the Brooklyn Botanic Garden. Our classes begin in September 2019 and run through mid-June 2020. Brooklyn Nature Days meets for 35 weeks throughout the year with holiday breaks in December, February, and April. Committing to our full year program guarantees your child a space throughout our fall, winter, and spring semesters, as well as a discounted tuition over enrolling by semester. We offer a select number of spaces for year round enrollment to those families we feel are best matched to our program and passionate about our philosophy. Please note - classes are mixed age and denoted by drop off location. If you would like your child in the same group as another child, please note the request in the application and apply for the same drop off location. Sibling discounts: Initial tuition paid in full, 10% off subsequent sibling tuitions. Tuition Schedule - An initial non-refundable deposit in the amount of 10% of the yearly tuition is due upon enrollment to secure your child's place. An additional $50 registration fee is due upon enrollment. The remaining payments are divided into either 3 or 10 installments over the course of the year beginning August 2018. Each family may choose the payment option that works best for them. PLEASE NOTE: In order to be considered for the Full Year Program, families must schedule and attend a visit by January 25, 2019 and submit their application by February 2, 2019. Each family must schedule and attend a class visit with their child. Available times can be found here. After your visit you will receive a link to your online application. If you are interested in enrolling your child in our program, you must complete and submit the application and $35 application fee within 2 weeks of your visit. Families will receive notice of acceptance February 2019. Ready to get started? Click here to schedule a visit! PLEASE NOTE: This process only applies to our year-round preschool alternative classes. If you are looking to enroll your child in our by-semester classes please check back on our website after March 2019.